The outsiders who brought modern winemaking to the region may have put Priorat on the map, but when they planted new vineyards, they built wide terraces that could support tractors, not realizing until later how terraces could cause erosion and disrupt the land's natural water retention. The steep relief of the Priorat region and the typical Mediterranean climate with torrential downpours often reaching 100 mm in a few hours makes the area very vulnerable to soil erosion. Traditionally, wine growers have overcome these adverse conditions by constructing small dry stone walled terraces to reduce the natural slope of the land. This technique, based on plentiful and cheap labour, has created a characteristic and highly valued landscape, attracting wine tourism. � Keep the soil and retain water. The primary purpose of the terraces is controlled evacuation of rainwater, so as to avoid soil erosion as much as possible. � Control of water runoff increases the chances of infiltration of water into the root zone of the plant. � Allow for safe mechanisation without the occupational hazard of machinery overturning. The terraces act as service corridors for maintenance tasks such as pruning, disease control and harvesting. Mechanization requires that the width of terraces is the minimum necessary for the passage of agricultural machinery. However, traditional hand-built dry stone terracing is no longer economically viable. One of the main techniques for increasing productivity in Priorat is industrial terracing that allows for the mechanization of farming. The characteristics of Priorat viticulture and the environmental problems created by industrial terracing are summarised below. � The average gradient is 46%. � Vineyards are located between 200m and 600m above sea level. � Between 1986 and 2003, 60% of the traditional vineyards were abandoned. � the number of vineyards have increased by 44% between 1986 and 2003, and 93% between 1998 and 2003. � Impact on the landscape. The wider terraces tend to break the harmony of the landscape producing an industrial 'quarry' effect. � Soil Erosion. Loss of soil can be intense, because of the excessive length of the slopes, and a lack of well designed drains. The wider terraces allow for mechanisation and are more economically viable. However, they tend to break the harmony of the landscape producing an industrial 'quarry' effect. They are often poorly drained and vulnerable to landslides. � Impact of raindrops. If the rain is very intense, the force of raindrops destroys components of the soil structure. This process is accompanied by a decrease in porosity. The erosive power of water is heightened by long periods of drought which leaves the soil dry, cracked and devoid of vegetation cover that helps mitigate the impact of downpours. � Runoff. This is the main mechanism of water erosion. The rainwater that cannot infiltrate into the ground runs across the surface, dragging particles of soils in its wake. Runoff erosion depends on many factors, including the intensity of rainfall, the density of vegetation cover, the topography of the land, the infiltration rate and water storage capacity. � Reducing the thickness of the layer of soil on the plots affected. � Declining soil fertility, associated with the loss of mineral and organic nutrients. � Destabilisation of slopes and increased risk of landslides. � Sediment and the chemicals from fertilizers and pesticides can pollute waterways. � Water will accumulate in terrace depressions or where the build up of sediment acts as a small weir. The impasse of water can suddenly break, leading to a runoff of water and mud with a remarkable destructive power. Recently, as the people in the region have witnessed the environmental challenges created by the rush to build terraced vineyards on ever-steeper hillsides, new regulations have been passed. Terraces are forbidden on the steeper slopes, and at least 40% of the natural vegetation must be preserved. Guidelines for sustainable terracing including terrace design criteria, are summarised below. Environmental problems of industrial terracing can be overcome if adequate design criteria are implemented. 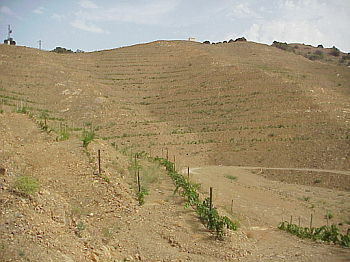 The risk of erosion is not a function of the natural slope of the terrain, but the design of the terraces: a poorly designed vineyard on a slope of 25% will have more erosion that some well-designed terraces on a slope of 50%. � Harmonious integration of the terraces in the landscape, with the height of embankments limited to 1.5 m to reduce visibility and a 'quarry' effect. � The width of the terraces should only allow for the planting of one row of vines. � All terraces should have side drainage channels. The drainage channels should be located in the 'ribs' of the mountain, where the rock is resistant to erosion. Poor terrace design: terraces and drainage channels should avoid concave areas where sediments accumulate and there is a high risk of erosion. Terraces should not be constructed on the summit line. � The length of the terraces is limited to 200 m, in order to avoid erosion. Half of the terrace (100 m) drains into a canal and the other half, toward the opposite channel. � The plant layout in the terraces should follow the contour lines. � Terraces should not be constructed on the mountain summit line. � Trees and rock outcrops should be preserved to maintain the traditional landscape value, to break the continuity of the vineyard and at the same time, provide a rest area with shade for workers. � Preservation of riverbank vegetation of gullies or streams. � Preservation of buildings of heritage value. � Farm roads should be open for public use and integrated into the infrastructure network to support wine tourism. � Access roads to the terraces should be zigzagged, so that the slope does not exceed 10-15%. With steeper slopes, the risk of roll-over of machinery is considered unacceptable. Wine Farms or Wind Farms? The revival of the region has shown the value of maintaining mountain viticulture and social and political mobilisation backed by the vinicultural sector managed to halt a government plan to convert Priorat into a major wind-power producing centre. Priorat alleged that the plan was incompatible with the project designed to foster the quality of the wine and landscape. The Priorat has begun to debate its development model while, in the meantime, the region's main mountain range, the Serra del Montsant, has been declared a Natural Park. The debate has begun and time will tell.